In the midst of a busy weekend, I had time on an early December Saturday to make a quick visit to Bay Grape Wine Shop in Oakland for a tasting of La Clarine Farm wines. The shop, which opened in late summer 2014, is run by the husband-and-wife team of Josiah Baldivino and Stevie Stacionis. Josiah was formerly the lead sommelier at Michael Mina restaurant in San Francisco, while Stevie (who’s also a certified sommelier) has worked in wine retail and writing. 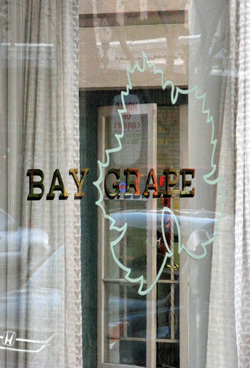 Their new space is tall and open, with a terrific selection of often hard-to-find wines from California and beyond. They also carry a fine selection of craft beers, and offer limited food as well as regular tastings and classes. The shop is located only a 10-minute walk from my home, so I had just enough time to stop by in the afternoon. Hank Beckmeyer and his wife Caroline Hoel were on hand to pour several of their La Clarine Farm wines. I’d visited Hank and Caroline in late 2012 at their vineyard and winery in the Fair Play appellation of El Dorado County in the Sierra Foothills, and it was one of the more memorable wine visits I can remember. Hank and Caroline had both worked in the music industry in Europe, and they moved to California in 1999, Hank to pursue his interest in winemaking and Caroline to continue her work with making cheese. She made it commercially for awhile but now does it for a hobby (they have a small herd of goats at their property). They have a two-acre vineyard just up the hill from their home and small winery building, planted to Tempranillo, Syrah, Grenache, Tannat, Cabernet Sauvignon, and a tiny amount of Negroamaro. But with such a tiny vineyard of their own, they purchase most of the fruit for their wines. La Clarine 2013 Mourvèdre, “cedarville,” Sierra Foothills. Light garnet color, with pretty aromas of red fruits, flowers, savory herbs, spice, and a strong stony mineral component. Medium-light weight and very lively on the palate, with fairly mild tannins and a long, minerally finish, very nice. La Clarine 2013 Mourvèdre, “ambrosia,” Sierra Foothills. Medium-light ruby color, this had a more earthy character, along with somewhat riper and higher-toned plum and black cherry fruit, plus touches of smoke and grilled meat. Bigger and more structured than the “cedarville” bottling, with grippier tannins and a slightly tangy finish. La Clarine 2013 Syrah, “sumu kaw,” Sierra Foothills. Just bottled recently, to be released early 2015. Medium-dark purple, this had savory and somewhat stemmy/herbal aromas, plum and darker berry fruit, smoke, with a gamey/meaty note. Medium weight with good structure and a lively texture, finishing with big, chalky tannins – already tasty but should age nicely. La Clarine 2008 Syrah, Sumu Kaw Vineyard, Sierra Foothills. From magnum, includes a little Mourvèdre. Medium-dark purple, featuring riper plummy fruit, spice, and a touch of smoke on the nose. More full-bodied on the palate, with round tannins on the finish, still tasting quite youthful. The La Clarine Farm winemaking is minimalist, and Hank’s aim is to add nothing to the wines during fermentation and aging. All the wines undergo native yeast and malolactic fermentations, and typically no SO2 is added until shortly before bottling. Reds are all fermented with 100% whole clusters that Hank foot-stomps in smaller fermentation bins. No new oak is used for aging the wines. Early vintages were bottled with glass closures, but more recent ones have all had screwcaps. 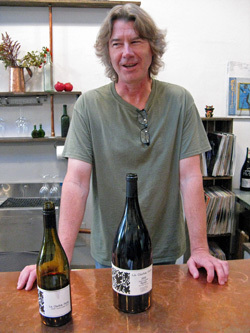 The first two wines that Hank poured at Bay Grape were his two 2013 Mourvèdre bottlings, which were a complete contrast to one another, displaying their different terroirs. We started with the Mourvèdre sourced from Cedarville Vineyard. Hank and Caroline’s friends and nearby growers Jonathan Lachs and Susan Marks of Cedarville have been selling them their Mourvèdre since 2007 – in fact, that was La Clarine Farm’s first commercial release. From vines planted on decomposed granite soil, this is a lighter-bodied Mourvèdre with beautiful, almost Pinot-like aromatics and loads of stony mineral character. Next was the Mourvèdre sourced from Ambrosia Vineyard near the tiny town of Swansboro to the northeast of Placerville. Hank describes the soil there as yellow slate, with loamy topsoil. This wine is the masculine counterpart to the more feminine Cedarville bottling – darker, earthier, with more powerful tannins. Hank followed the two Mourvèdres with a 2013 Syrah from Sumu Kaw Vineyard (this will be released in January 2015), not far from Sierra Vista and Holly’s Hill in the Pleasant Valley area of El Dorado County, between Placerville and Fair Play. The soil there is volcanic loam, and like the two Mourvèdre vineyard sites, it’s at fairly high elevation – all three are between 2,500 to 3,000 feet. Hank said that it took him a few years to get a good handle on this vineyard, but along with Cedarville, it’s become one of La Clarine Farm’s key fruit sources. This wine displayed classic Syrah character – dark fruit, meat, herbs, a bit of smoke. And Hank finished the tasting with a real treat, a library wine magnum of his first Sumu Kaw Syrah release from 2008. And on top of that, the bottle was one of the few La Clarine Farm wines ever bottled with a cork closure! The regular 750ml bottles that year had glass closures but the magnums had cork. Tasting this wine gave a clue as to how the 2013 might develop, though the 2008 was a noticeably riper vintage for the Syrah from this vineyard. This was a very enjoyable, low-key tasting. As I was going through the wines with Hank, I kept watching Caroline create a cool drawing of one of her goats as she relaxed at the tasting bar. I liked all of the new La Clarine Farm wines quite a bit, and I thought the Cedarville Vineyard Mourvèdre was a particular standout, really one of the more distinctive and compelling California Mourvèdres I’ve tasted in awhile. Thanks to Josiah and Stevie for hosting this fun event at Bay Grape and thanks to Hank and Caroline for making the trek down from the Sierra Foothills to pour their wines!